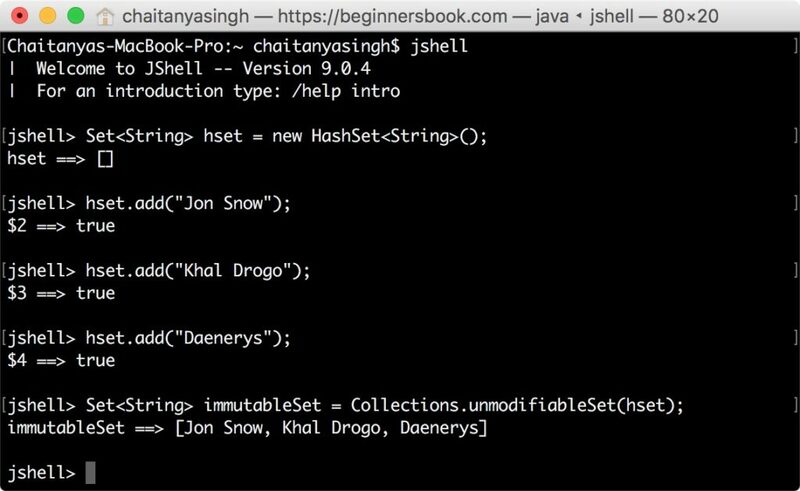 In the last tutorial, we learned how to create immutable lists with ease using the factory methods introduced in Java 9. In this guide, we will see the use of newly introduced factory methods to create immutable Sets. Before we discuss how to use the factory methods to create unmodifiable Sets, lets see how we used to create immutable set prior to Java 9. Prior to Java 9, we have to use unmodifiableSet() method of Collections class to create immutable Set. In the following example we are creating an empty set. This is how we used to create non empty immutable Sets before Java 9. As you can see we have to write several lines of code to get this working. In Java 9 we can write this code in a single line, we will see that in the next section. Java 9 introduced couple of versions of of() method to create unmodifiable Sets. As you can see how simple it is to create immutable set in Java 9. 3. What is an immutable Set? 1. An immutable Set doesn’t allow the add, delete and update of its elements, if we try to do that then we will get UnsupportedOperationException Exception. Lets take an example to see this. 2. We cannot add null elements to an immutable Set.